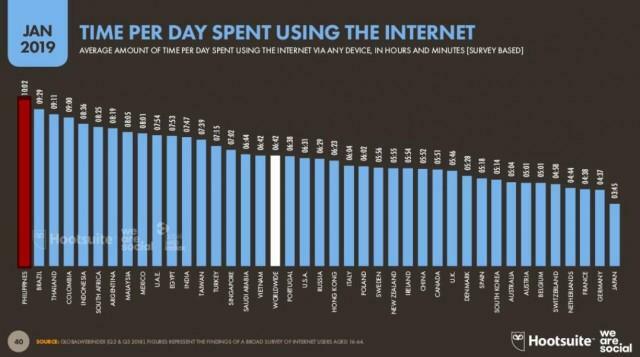 The Philippines has topped the global list for time spent online with an average og 10 hours and two minutes of screen time every day. Other Southeast Asian countries in the top five were Thailand and Indonesia, according to the 2019 Global Digital Report released by HootSuite and We Are Social. Ranked third, people in Thailand were found to spend an average nine hours and 11 minutes online each day, while those in Indonesia also devoted more than a third of their day to screen time, clocking in at an average eight hours and 36 minutes. Filling out the top five were Latin American countries Brazil and Colombia, which were ranked second and fourth, respectively. The report reveals that 57 per cent of the world’s population is now connected to the internet, spending an average of 6.5 hours online each day. The report’s author, Simon Kemp, has calculated that the “world’s digital community will spend a combined total of more than 1.2bn years using the internet in 2019”. The findings from the Digital 2019 report show that most time spent online is via mobile devices, with the greatest portion of that time spent on social media. It also charts an exponential increase in the number of new internet users. The country that experienced the biggest jump in internet usage last year was India, which saw the number of internet users jump by almost 100 million last year. Despite (or perhaps because of the massive amount of screen time), the Philippines continues to lag behind when it came to average fixed connection speeds. Singapore was at the top 190.9 mbps, while the country’s was just a tenth of that speed — at a measly 19. Social media penetration in the country is at 71 per cent, above the worldwide average of 45 per cent, the report said. Some 79 million Filipinos aged 13 and older are users. Social media grew in the country by 13 percent, with more than nine million users added since January last year. 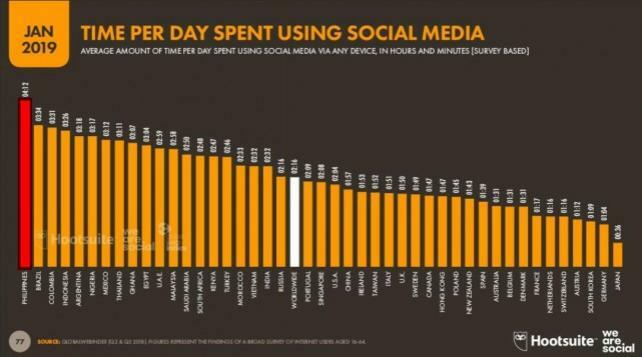 Filipinos also spent the most time on social media at four hours and 12 minutes on average per day. Facebook is the most used social media platform in the Philippines, with more than two million new users since last October. And as we reported last December, Filipinos have maintain their long -running record of spending longest per visit on the adult website Pornhub. The average visitor to the site lasts 13 minutes and 50 seconds in the Philippines. This compares to a global average of 10m 37s.